Live Nation Canada is proud to announce the first annual CHAOS AB, Alberta’s newest rock festival. 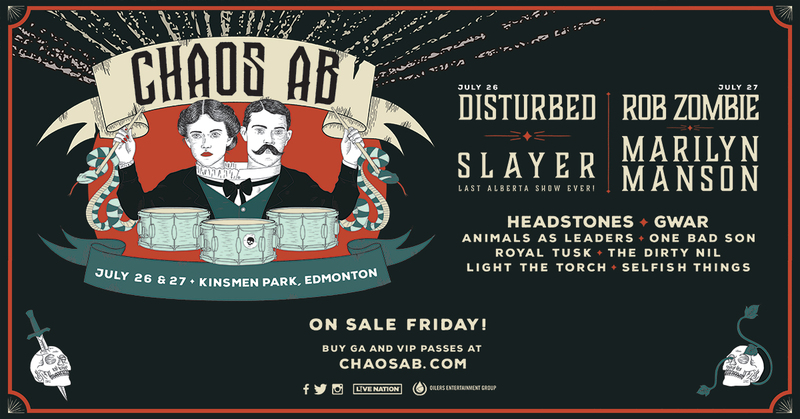 Taking place at Kinsmen Park in Edmonton, AB on Friday, July 26 and Saturday, July 27, the inaugural CHAOS AB will feature headlining performances from Rob Zombie, Marilyn Manson, Disturbed, Slayer – for their last Alberta show ever! With a long history of successful rock shows in Alberta, Live Nation Canada identified an opportunity for an all-rock music festival designed specifically for fans across the province. Fans of all ages will enjoy unforgettable musical performances, plus a wide range of food trucks, vendors, and onsite activations catering to the unique tastes of the rock crowd. In working with the City of Edmonton, CHAOS AB is anticipating thousands of fans to attend the event each day in the first year. Kinsmen Park was selected as the ideal location to host the festival due to its picturesque proximity to the North Saskatchewan River and its previous use as an outdoor concert venue. As fan parking will not be available onsite, festival shuttles will be running three different routes across the city from the Downtown core, University: Education Car Park looping on to 97 Ave, and from the festivals’ VIP Parking location. Fans are also encouraged to take the LRT or bus to the festival site. The nearest LRT stops are University Station and Grandin/Government Centre Station.